two witches, and a knife that flashes to the dead like a damn lighthouse. Anna Korlov was dead long before Cas Lowood met and fell in love with her and he knows he should be moving on. But he can't. In the months since Anna Dressed in Blood dragged the Obeahman into Hell, Cas finds himself haunted by a specter he can't slay. He sees Anna everywhere; asleep or awake she appears, visible only to him and seemingly caught in some tortuous circle of punishment that leaves her unable to truly rest in peace. Cas is determined to discover what kind of underworld Anna has become trapped in and rescue her from her torment. But opening the door between worlds requires a steep price, one that Cas cannot pay alone. With her trademark blend of creepy images and relatable characters, Kendare Blake continues the story of Anna Korlov, ghost, and Cas Lowood, ghost hunter, in her newest novel Girl of Nightmares. I'll admit, I was a bit hesitant when I heard that Anna Dressed in Blood was going to have a companion novel, I loved the first book so much that I was concerned another novel set in that world would fall short. 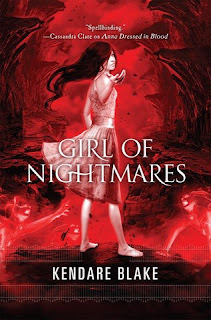 But Girl of Nightmares lives up to it's predecessor and provides the reader with another intriguing chapter in the life of Cas Lowood and his friends. Girl of Nightmares has all the elements of horror and paranormal mystery that readers expect. 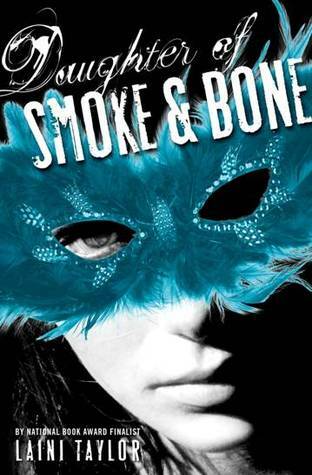 The writing is vivid and evocative without being overdone and the voice of Cas is jarringly authentic. One of my biggest complaints about paranormal/horror mysteries, as a genre, is that characters involved in that type of world rarely show signs of PTSD or stress related to their constant battles (both mental and physical). Blake creates characters that could, and might even, be at any high school. 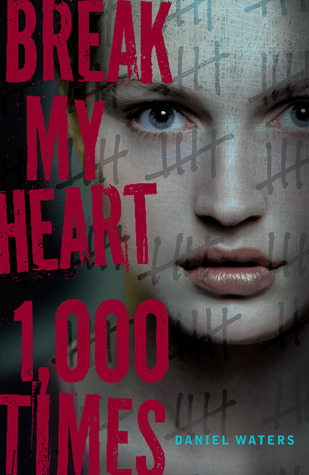 Her characters are real and the events of their lives impact their mental, emotional and physical health. Cas's suffering makes him real. When haunted by visions of Anna being slowly torn to shreds or burned alive, Cas does not automatically assume a paranormal root, but that may be images created by his own scarred psyche. Blake knows how to give the reader just enough detail to make them create their own personal horror that will haunt their brains long after the book is finished and the light turned out. Highly recommended. Recommended Ages: 14+ Some profanity & disturbing images.